Who loves 90s nostalgia? You love 90s nostalgia! Is it true? If it is, then we have some good news for you. Kenan & Kel was a staple for us 90s kids’ after school days on Nickelodeon, but it’s been 18 years since we last saw the boys on our TV screens and 13 years since their sketch show All That ended. If you’re feeling suitably old now, then let’s keep going, because you’ll be delighted to learn there’s going to be an All That reunion in an upcoming episode of comedy gameshow Wild ‘n Out. We first heard about the reunion from Kel Mitchell, who posted a bunch of pics on Instagram – but he’s not the only one in the studio. In the snaps, you can see other cast members from the show, Lori Beth Denberg and Josh Server, who are both on board for the new outing. Kenan game face is epic in this pic!! #wildnout. This isn’t the only time there’s been a reunion of the iconic duo, as the two graced our screens together for one night only on the Jimmy Fallon show. It might have only lasted for seven minutes, but it featured the two fast food servers, Jimmy Fallon himself, Ed Mitchell, a ‘spicy chicken rap’ and one customer being covered in mustard. 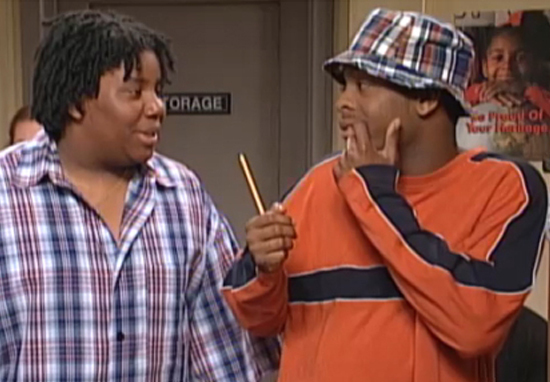 Speaking of the single sketch, Kel told Digital Spy at the time, a full Kenan & Kel reunion was on the cards. Oh yeah, we’ve definitely been talking about it. Just to get back in those shoes, on stage together, we were both like, ‘Oh man, we gotta do something together again’. Now, this full reunion might be a long time coming, as both are fairly busy in their own respective pursuits. Kenan is the longest serving member of the SNL cast and has a three-year-old daughter with Christina Evangeline. Kel has three daughters, one with his wife Asia Lee and two with ex Tyisha Hampton – he currently stars on the Nickelodeon series Game Shakes. They’re getting on with their lives, but at one point there were rumours Kel had actually died – back in 2006 – despite him obviously being alive and well. As soon as they called and I picked up, I think they figured it out. It was kind of laughable, you know what I mean? It’s laughable, but at the same time, it’s a serious matter. It’s shocking to me that someone would sit there and say someone else died. Thankfully, Kel is 100 per cent alive and kicking, so the chance of a full Kenan & Kel reunion isn’t off the cards.